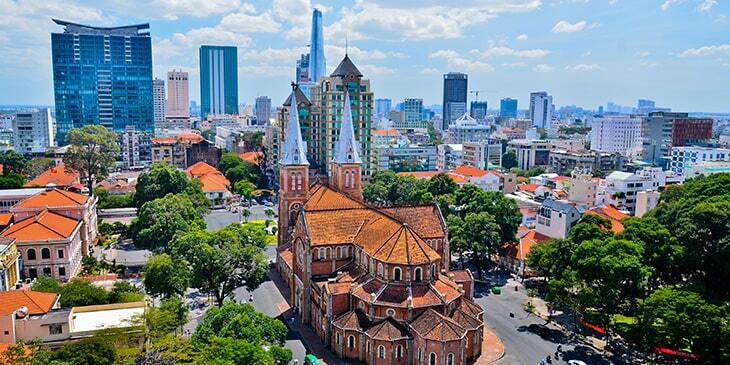 Ho Chi Minh City is a bustling Vietnamese city with distinct neighbourhoods, an incredible food scene, a mixture of modern monuments and French colonial buildings, museums and galleries, authentic markets, a colourful night scene and trendy hotels with panoramic rooftop bars. This metropolis is also home to a plethora of iconic architectural landmarks. You could start by visiting the Notre-Dame Cathedral, which allows you a glimpse into the city’s bygone era with Roman-style architecture, stunning stained glass windows and impressive bell towers. The Saigon Central Post Office is another majestic structure featuring French Colonial styles, as is the Jade Emperor Pagoda, featuring Chinese-style architecture with ornate carvings and statues. Brightsun Travel has plenty of cheap flight deals to Ho Chi Minh City, so you could plan and book a great value getaway here. HCMC is famed for its excellent range of museum and gallery spaces that allow you to delve into Vietnam’s colourful cultures, rich history, art and more. The War Remnants Museum is a popular spot, dedicated to the Vietnam War with 20,000 artefacts, documents and movies from this traumatic period of time, including preserved tanks and planes, photographs and military uniforms. The city’s Museum of Vietnamese History is also worth a visit; this interesting institution takes you back in time to discover pre-war and pre-historic Vietnam through a collection of ancient documents and artefacts. Then there’s the Fine Arts Museum, a colourful cultural venue with an extensive collection of contemporary art and historical art pieces. Artworks displayed at this museum include paintings, sculptures, lacquerware and ceramics. There are many other excellent attractions in the city worth exploring. Make sure you add the Cu Chi Tunnels to your itinerary – this enlightening network of tunnels allows you to experience what daily life was like for Vietnamese soldiers during the war and learn about how they survived during this extremely traumatic time. For some cultural immersion you could visit the Golden Dragon Water Puppet Theatre to catch a traditional water puppet show, take a stroll around the bustling Ben Thanh market to browse/buy local souvenirs, Vietnamese cuisines, handicrafts and clothes or venture out for the day on a tour of the Mekong Delta aboard a traditional sampan. Book cheap tickets to Ho Chi Minh City from India and look forward to an array of amazing adventures in this popular Vietnamese city.